WJSG Internet Radio: Kasabian's '48:13' Arrives at No. 1 in U.K.
Kasabian's '48:13' Arrives at No. 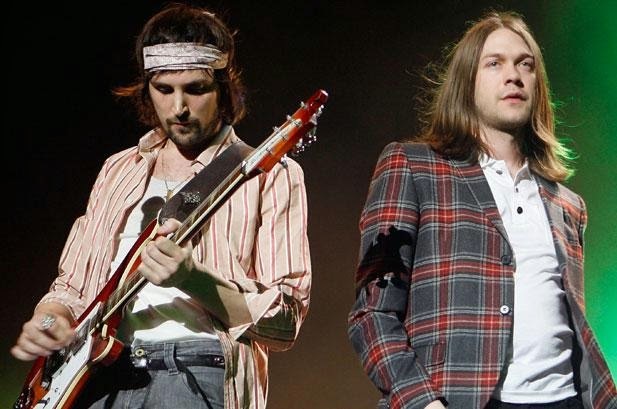 1 in U.K.
British rock staples Kasabian notched their fourth U.K. No. 1 album as “48:13” (Columbia/Sony) debuted at the top with 70,000 sales on Sunday (15), according to Official Charts Company data. 2012 “X Factor” contestant Ella Henderson scored an instant No. 1 single with “Ghost” (Syco Music/Sony). Kasabian, who’ll headline the Sunday night slot at the Glastonbury Festival June 29, first topped the U.K. album chart in 2006 with their sophomore release, “Empire.” The band from Leicester in the English midlands repeated the feat in 2009 with “West Ryder Pauper Lunatic Asylum” and 2011 with “Velociraptor!,” which sold 94,000 units in its first week. Coldplay’s former chart-topper “Ghost Stories” (Parlophone/Warner Music) started a third week at No. 2 as Sam Smith’s “In The Lonely Hour” (Capitol/Universal) fell to No. 3 after two weeks at the summit. Jack White’s “Lazaretto” (XL Recordings) started at No. 4, with 25,000 sales, and Passenger’s “Whispers” (Black Crow) is at No. 5, with 23,000. Dolly Parton’s “Blue Smoke” (Sony Masterworks), the U.K. release of which was held for the start of her extensive British tour on June 8, with a second CD of her hits stripped onto it, came in at No. 6, her highest-ever album ranking in the market, with 20,000 sales. First Aid Kit’s “Stay Gold” (Columbia/Sony) debuted at No. 11 and Rival Sons’ “Great Western Valkyrie” (Earache) is at No. 14. On the compilation chart, “Eddie Stobart Trucking Songs — Trucking All Over The World,” a three-CD collection of hits by Queen, Status Quo, Fleetwood Mac et al, in celebration of a well-known haulage company and promoted around Father’s Day, rose 7-1. Henderson’s single, co-written by OneRepublic’s Ryan Tedder, sold more than 132,000 in its first week, the fourth-highest opening tally of the U.K. singles chart year. Ed Sheeran’s “Sing” (Asylum/Warner Music), which entered at No. 1 last week, fell a place, with second-week sales of 62,000. Tiesto’s “Wasted” (Virgin/Universal) featuring Matthew Koma was new at No. 3, the Dutch DJ’s highest U.K. singles chart placing, with close to 49,000 sales. Female pop hitmakers Little Mix climbed 24-6 with “Salute” (Syco Music/Sony) after performing it on the June 7 final of “Britain’s Got Talent.” The untimely death of popular British comedian Rik Mayall on June 9 at the age of 56, which prompted a social media campaign to get his 2010 soccer World Cup-themed single “Noble England” (Motivation), saw the track chart for the first time at No. 7.